We do our best to accommodate every horse in comfort and compatibility. New horses are introduced, turning them out close, but separate from the established target group before determining which small group each horse is most compatable with. The separation may last up to two weeks before the newcomer joins an adjoining group. Our fences and stalls are well maintained. The grounds and amenities are examined on a daily basis. 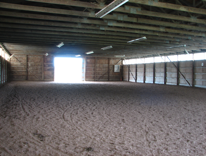 The indoor and outdoor arenas are dragged and the indoor arenas watered weekly, or as frequent as needed. There is a full time barn manager on the grounds to assist, answer questions, and monitor safety. The 12x12 and 12x13 box stall floors have been prepared with a layer of creek stones under fill dirt to allow natural drainage for dry standing area and for horses who lay or roll in the stall, unlike matted stalls that force horses to stand in urine and wet manure between cleanings. We apply a sanitizing deodorizer routinely to heavy urine spots. Grain fed to worked horses and through the winter is custom mixed for seasonal ratios of oats and corn: 75:25 in summer, 50:50 spring and fall, and 25:75 in winter, respectively. Vitamins A, D & E, selinium, trace mineral salt, molasses (as a binder,) biotin, and flax seed (our omega 3 source) round out our feed mix. 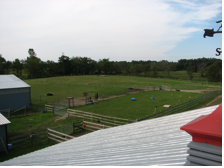 Trace mineral salt blocks are provided by the watering tanks in each pasture. Our hay is a high quality grass hay with a small amount of alfalfa, purchased from personally known farmers with local fields. We practice land management by feeding hay as a supplement or substitute for pasturing before the pasture becomes over-grazed in the summer. Through the winter we utilize round bales or feed square bales two to three times a day. We practice extensive pasture turn out through late fall to allow the horses to develop healthy, natural, winter coats. Frost temperatures (35 degrees and lower) are the general "rule of thumb" for bringing in the animals at night. Common sense and the health and well-being of the horse are ALWAYS priority. 2) Horses are brought into the barn “in hand” and not allowed to be free in the barn aisle. 3) Halter hooks on the stall doors are provided and limited to a halter and lead rope only. 4) No glass containers allowed in any cement floor area. 5) Horses tacked in their stall require the owner to re-clean the stall if the horse soils the stall that is already cleaned for the day. 6) The tacking stations and aisleway cross ties are not for long term tie stalls. Horses are to be groomed and tacked up within a reasonable amount of time to allow other horses use of the tacking stations or cross ties. 7) The indoor and outdoor arenas are not turnouts for unattended horses. 8) Keep grooming kits out of walk-way areas. 9) Boarders are encouraged to find a permanent means to mark all equipment and to store extraneous, non-essential, and off-season items at home. 10) Keep the barn tidy for everyone. If you use the cross ties, please pick up and sweep up any droppings, farrier's residue, and hair clipped or brushed from your horse. 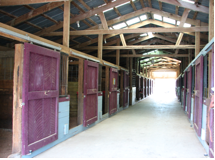 11) Horses are not to be led through any human doorway, but taken only through the large doors to access outdoor riding or trailering. 12) Guests must be accompanied by a boarder and the accompanying boarder is responsible for any young children brought with their guests. 13) Unleashed or unattended dogs or other pets are not allowed on the property. 14) Turn out unused lights and all lights when the last one leaving the barn.